"This large chalet is perfect for groups due to the large open plan dining/lounge area downstairs and the additional seating area on the mezzanine, which is perfect for socialising after dinner. 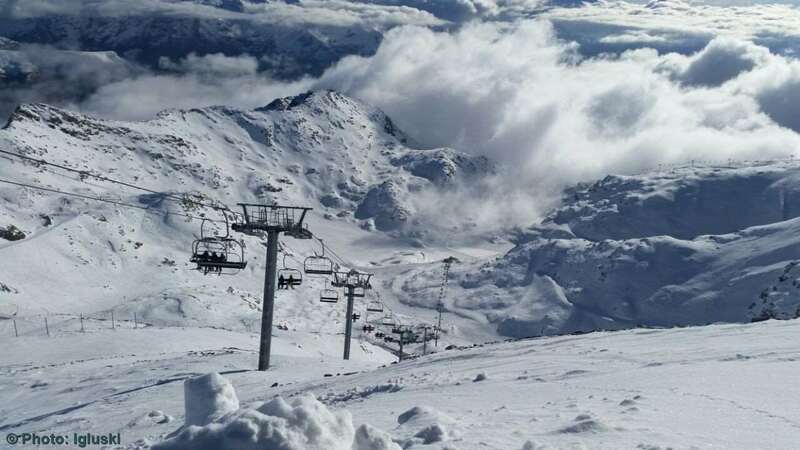 You can ski off-piste almost back to the chalet and the town centre is a short walk away. " This chalet is the perfect choice for keen skiers and also for those wishing to enjoy the nightlife and facilities this lively resort has to offer. Located in the centre of Les Deux Alps, with just a 5 minute (approx) walk to the Jandri Express ski lift and the foot of the pistes. Chalet Alice is a modern freestanding chalet offering all the comforts and facilities you need to have a great holiday. The chalet is split into sections affording all rooms a high level of privacy. Rooms 1 – 3 are each accessed separately from an open walk way just along from the main entrance. Rooms 4 - 6 are also accessed separately from an exterior walkway directly above. All of the communal areas and room 7 are accessed via the main entrance. As well as benefiting from a sauna, the chalet is modern, light and spacious with a lounge/dining room overlooked by an additional comfortable area on an open raised mezzanine. The extra beds in room 7 are in a separate sleeping area through which is the bathroom. This was my first ski holiday, and I have to say it was one of the best holidays I have ever had. There was a group of 14 on the trip, all had different skiing experience. The resort had enough to keep everyone happy. The chalet hosts Sam and Louise were absolutely superb. They were so friendly and welcoming. After a days skiing it was great coming home to some gorgeous cakes and tea. The dinners were delicious, the perfect end to a day on the slopes. After a few days on the nursery slopes I went to the top the glacier and had a fantastic day skiing back down to the Pano Bar. The atmosphere was amazing, you could hear the music from 500m away. Had a great time, and have definitely got the skiing bug. I would love to go back next week if I could. My second visit (end of March 2011) to Les Deux Alpes (last time was in 2005) and the place has improved a lot. Snow - superb! Chalky powder with some great runs. You can nail most of the mountain within a day but some of the runs are great so you don't mind doing them again. The day pass to neighbouring resorts included in the lift pass is a great offer. Weather - superb! Snowed for 24 hours when we arrived then mostl glorious sunshine Village - expansive with some great bars/clubs and shops. Accommodation - basic but suited our needs fine. Place was clean, the food was ok, but there were some querks such as the hot water in the showers running out!